TEquipment.NET is proud to announce that RIGOL’s latest oscilloscopes are now in-stock and ready to ship. We are offering an exclusive 60-Day Money Back Guarantee on these units to show not only our confidence in these oscilloscopes, but also in RIGOL as a brand. TEquipment.NET is proud to announce that RIGOL’s latest oscilloscopes are now in-stock and ready to ship. The new RIGOL DS7000 and MSO7000 Series are the world’s most powerful and affordable mid-range oscilloscopes. With 10GSa/sec Sample Rate and up to 500M Record Length, the RIGOL 7000 Series can deliver 20X oversampling on a 500MHz signal providing unmatched signal resolution while still capturing a full 50ms. The RIGOL DS7000 series starts at $2,699. It includes four models of digital oscilloscopes, each with 4 analog channels. The DS7014 has 100 MHz bandwidth and ≤3.5 ns rise time, the DS7024 has 200 MHz bandwidth and ≤1.75 ns rise time, the DS7034 has 350 MHz bandwidth and ≤1 ns rise time, and the DS7054 has 500 MHz bandwidth and ≤700 ps rise time. The RIGOL MSO7000 series starts at $3,999. It includes four models of mixed signal oscilloscopes, each with 4 analog plus 16 digital channels. The MSO7014 has 100 MHz bandwidth and ≤3.5 ns rise time, the MSO7024 has 200 MHz bandwidth and ≤1.75 ns rise time, the MSO7034 has 350 MHz bandwidth and ≤1 ns rise time, and the MSO7054 has 500 MHz bandwidth and ≤700 ps rise time. For both digital and mixed signal units, all other specifications including sample rate, record length, and waveform capture rate are identical across the series. “We are excited to offer the new RIGOL 7000 Series to our customers because it provides high-end capability at an affordable mid-range price," says Evan Cirelli, Vice President of TEquipment.NET. “We are offering an exclusive 60-Day Money Back Guarantee on these units to show not only our confidence in these oscilloscopes, but also in RIGOL as a brand." The RIGOL 7000 Series is powered by the new UltraVision II architecture and new Phoenix chip-set, both developed in-house by RIGOL engineers. Analog front end and signal processing performance comes from two custom ASICs. These chips are surrounded by a high-performance hardware design which includes Dual Core Arm-9 Processors, Linux +Qt Operating System, High Speed DDR System Memory and QDRII Display memory. This architecture gives all RIGOL 7000 Series units a high waveform capture rate of 600,000wfms/sec as well as a color graded intensity display and outstanding time-base accuracy and jitter performance. The RIGOL 7000 Series features a powerful user interface with next-generation features. A crisp 10.1-inch (1024x600) display supports responsive and intuitive touch navigation. RIGOL 7000 Series models also feature native HDMI support to drive large displays and control the instrument with a mouse. You can even control the instruments on your network via a tablet or smartphone thanks to touch enabled browser capability. The RIGOL 7000 Series provides a complete range of advanced analysis tools. These instruments offer 6-in-1 capability with an Oscilloscope, Logic Analyzer, Protocol Analyzer, Waveform Generator, Digital Voltmeter, and Counter/Totalizer all integrated into each unit. A range of analysis tools including Zone Triggering as well as standard Histogram and Pass/Fail Analysis make the new RIGOL 7000 Series a powerful mid-range debug solution. "We believe the 7000 Series is simply the most powerful and affordable mid-range oscilloscope in the market,” says Michael Rizzo, General Manager of RIGOL North America. 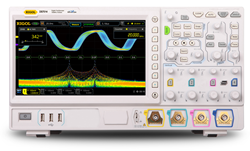 "…we encourage customers considering the MDO3000 from Tektronix or the DSOX3000T from Keysight to compare the performance, features and overall value of the RIGOL 7000 Series Oscilloscope." TEquipment.NET is a division of InterWorld Highway, LLC, a well-established, authorized distributor of major test equipment brands since 2002 with more than 60 million dollars in annual sales. The company is headquartered in Long Branch, New Jersey and employs a staff of highly skilled technical professionals who deliver world-class customer service. Today, TEquipment.NET carries more than 350 brands of test equipment products for a wide range of applications including R&D, soldering, thermal imaging, HVAC, preventive maintenance, process control, educational technologies, and much more. With warehouses in New Jersey, Pennsylvania, and Oregon, the company can provide fast delivery to anywhere in the world. For more information, visit http://www.tequipment.net.